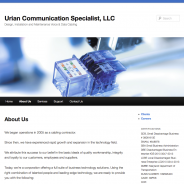 Specializing in the design, installation and maintenance of voice and data cabling infrastructure solutions. Our team is dedicated to maximizing the value of the services provided to our clients. Our certified installers work with each client to design and implement a structured wiring system that will reliably meet today’s communications challenges and accommodate the changes of tomorrow.